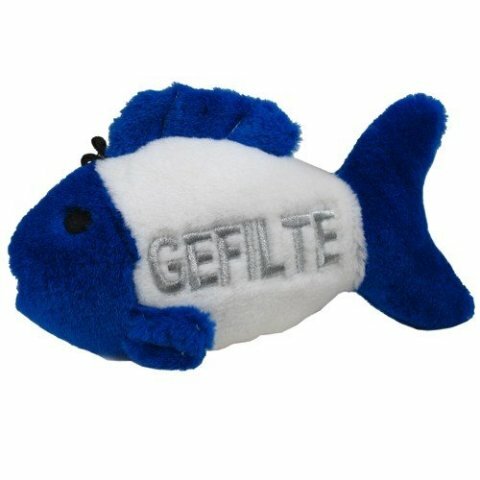 This unique dog toy design is a plush fish in the traditional blue and white with GEFILTE stitched on the side. The fish is somewhat interactive for your dog because if it is squeezed just right it will say "Oy Vey!" Was there ever a more appropriate phrase for a dog toy to let out when under attack? This is such a cute idea that even though I am not Jewish I would love to buy this if I had a dog. As it is I think my cat might be a little intimidated by it. To order a Look Who's Talking Gefilte Fish for a dog you love, click here.